The Objective: To optimize the fan performance by achieving desired pressure difference and torque between fan inlet and outlet and also validating the results obtained with experimental data. Solution: The radiator fan design was first evaluated through simulations to obtain pressure difference and torque values. In order to obtain the desired pressure difference and torque, a design modification was done by adding 4 more blades to the existing fan design. The results obtained were satisfactory and were also closely in match with the experimental investigation. The efficiency of automotive radiator is largely dependent on the ability of the fan to force the air draught as much as possible. In order to devise an effective fan design, the primary objective is to maintain desired pressure difference between the fan inlet and outlet. Hi-Tech assisted a research scholar from Germany in developing fan design to maintain the required pressure difference for radiator application. The customer’s primary concern was to develop the fan design to work within the specific pressure difference values. 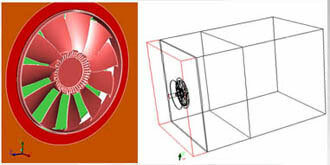 The radiator fan with 7 blades was first analyzed through CFD simulations and the pressure difference between the fan inlet and outlet were measured. An experimental investigation was performed for the same configuration, in order to validate the CFD results. 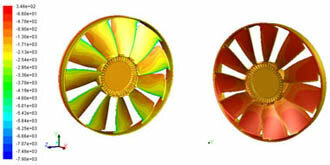 To improve the design further, 4 additional fan blades were suggested and flow analysis for the same was performed. Desired pressure difference was obtained through the modified design. Final results obtained were well in sync with the experimental data, validating the CFD setup.